Note: Stephen Berry is happy to field questions about the Warrys: email Stephen at: stephen.berry@tesco.net Stephen can email the Journal of Warry Family History to interested persons. Richard & Robert were brothers, possibly twins, both baptised on 10 December 1768 in Cricketmalherbie, sons of Robert Warry & Grace Pope. Richard was a farmer, and Robert was engaged in the occupation which the Warrys are well known – blacksmithing. A pedigree can be found on the Family Search site : https://familysearch.org but much of the pre- 1768 information is unverified. Robert was noted as being a pauper at the time of the baptism of Mary in 1794. Francis Warry, son of Richard & Ann, moved to Hinton St George, and later emigrated to Australia. widower, married a widow, Mary Withey, nee Langdon. At this time his occupation was noted as a Carpenter. 1839 at Stoford, Somerset. John emigrated to Queensland in 1858 on the same vessel as Samuel Osborne of Merriott and his family – the Alfred. Read more about this family on this page. noted on the 1851 census for Barrington. Eliel & Hannah Warry moved to Mosterton, Dorset, where Eliel worked as a Blacksmith. The family is noted at Mosterton for the 1851, 1861 and 1871 censuses. In the 1881 census Eliel appears in Yeovil, but was buried in Mosterton in 1884. Onesiphorus Warry was born in Haselbury, according to census information. Whether he was somehow related to the Merriott Warrys is not known. Onesiphorus married Thurza Patch in Merriott on 6th October 1825. Frederic & Mary Warry were not mentioned in Merriott records after their marriage. NOTE: The family can be found in Jersey, Channel Islands by the time of the 1841 and 1851 censuses. By 1861 Frederic(k) is back in Merriott as a widower, living with Robert & Jane Trask. Richard & Anna/Hannah Warry remained in Merriott. Richard worked as a Blacksmith, and was later a Dairyman/Farmer and landholder (mentioned in the 1892 Electoral Roll as owning Freehold land at Brimsmoor). 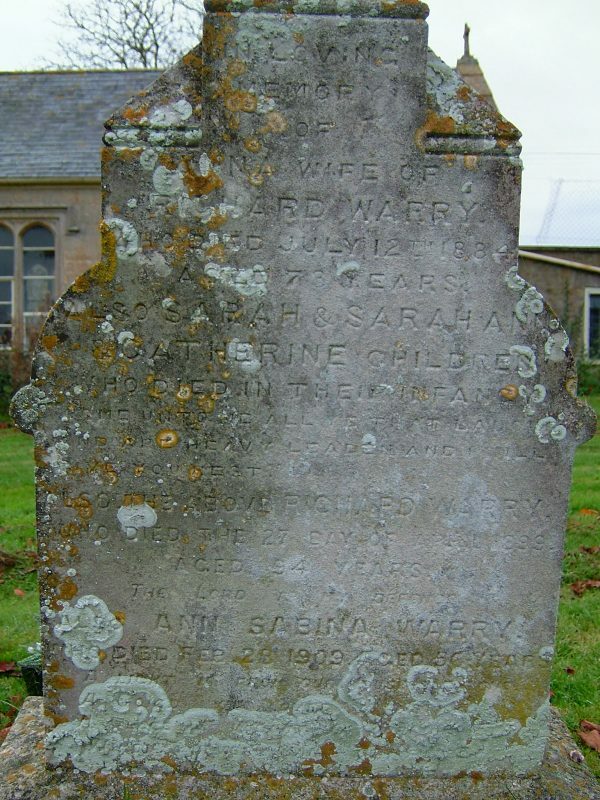 Richard died in 1899 aged 94 years, and was buried at All Saints, Merriott. Hannah died in 1884 aged 73 years and is also buried at All Saints. John Warry, born Chard, Somerset, son of John Warry, a shoemaker, was not mentioned in the Merriott records prior to his marriage in 1853 to local girl Mary Osborne. John worked in various positions at the Sail Cloth Factory. John & Mary appear on the 1891 census for Merriott, but I don’t have any burial data for them. Hinton St George. Four other children were born at Hinton St George. Note: Somerset Record Office has Photographic Albums with occasional notes and negatives of Eliel & Anna Warry of Merriott and Mosterton and one volume of their offspring, 19th & 20th Centuries. Accession No: S/1740; G/1764 Catalogue Mark: DD/WRY. Other Warry families from places such as Stoke sub Hamdon are also included. Headstone, courtesy of Adrian Wills. The surname WARRY accounted for about 1% of the population of Merriott at the time of the censuses, ranking 18th most common surname. 1851 330 008 Higher Street Warry Robert Head M 81 Blacksmith Som, North Cricket? There were no marriages recorded at All Saints Church 1901 – 1924; and only five burials 1901 – 1924. 2. Index of Warry Family Society Members. 6. Minute book of Warry Family Society 1981. 9. Alphabetical file of papers and correspondence relating to Warry, Gingell, Daubeney etc families c 1970 – 1985. 10.Correspondence concerning the Warry arms, including transcripts of Warry family wills, 16th & 17th century. 11.Correspondence and papers concerning Warry family genealogy including wills going back to 1582. 13. Coachman’s livery button used by Warry family at Shapwick House, c 1880. 15. Photographs of arms and armorial seals of the Warry and related family. 16. Photographs from portraits of members of the Warry family of Shapwick. Quite a lot of interesting detail for Warry researchers!